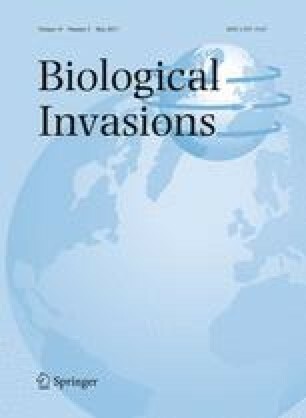 Species invasions can alter food web structure and change ecosystem-level functioning, but it is often unclear how these invasions may affect the life history of native species. The Lake Sturgeon (Acipenser fulvescens), a large long-lived native fish species in the Great Lakes, has increased in abundance in the lower Niagara River and nearby Lake Ontario during a period of invasive species-induced ecosystem change precipitated most recently by Dreissenid mussels (Driessena polymorpha and Driessena bugensis) and Round Goby (Neogobius melanostomus). Material taken from cross-sections of archived pectoral spines from Niagara River Lake Sturgeon captured in 1998–2000 and 2010–2012 were analyzed for stable isotopes across discrete growth zones to provide an ontogenetic assessment of diet, and diet analysis of Lake Sturgeon captured in 2014 was conducted to assess the contribution of invasive prey. Round Goby was the most important Lake Sturgeon prey item (86% by weight) in 2014, which corroborated results of δ15N and δ13C. Lake Sturgeon captured after the invasion of Round Goby exhibited ontogenetic changes in δ15N that differed from pre-Round Goby patterns, though this effect was weaker for δ13C. Values of δ15N from spine growth zones indicated non-linear increases in trophic position with age and increased rate of δ15N enrichment after the Round Goby invasion. We conclude that Round Goby establishment in western Lake Ontario changed the feeding ecology of Lake Sturgeon, which may have a positive effect on population growth for this native species. This manuscript was much improved by the helpful comments provided by John Sweka, Mike Millard, and four anonymous reviewers. Brian Layton, Zy Biesinger, Zeb Woiak, Jonah Withers, and many others helped assist with fieldwork and sample processing. Mention of specific products does not constitute endorsement by the U.S. Government. This study was funded by the Great Lakes Restoration Initiative. Any use of trade, product, or firm names is for descriptive purposes only and does not imply endorsement by the U.S. Government.